Verified on 13h April 2019. 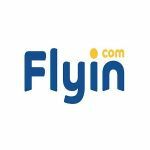 We have 6 Flyin deals for you to choose from including 6 Offer. Saudi Ebreez Company for Travel and Tourism is a registered company with a CR 1010313090 established in 2010 which owns flyin.com and located in Riyadh, Saudi Arabia.Flyin.com is a part of Saudi Ebreez Company for Travel and Tourism that owns and operates Flyin.com which is the first and only "Online Travel Agency" in Saudi Arabia that offers an integrated travel services and innovative solutions for people residing in Saudi Arabia, across the Middle East and around the world.